The anniversaries of these milestones remind us of the economic and social returns we have seen from ambitious Federal research and development programs. (Source: DARPA)On July 20, 1969, Neil Armstrong stepped out of the Apollo 11 lunar lander and set foot on the moon. 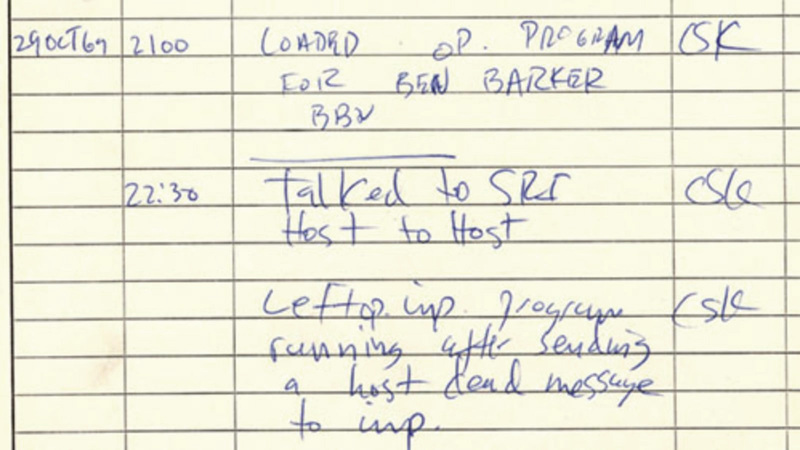 On October 29th, Charley Kline, an ARPANET programmer at UCLA, attempted to log in to a host at Stanford Research Institute (SRI), but the system crashed after he had typed LO. After a bit of debugging, he succeeded in typing LOGIN and the rest is history. These events were milestones in ongoing, federally-funded research and development efforts — the manned spaceflight program and the development of digital telecommunication networks from Morse's telegraph to early electronic digital computers and telemetry experiments, the SAGE early-warning system and eventually the ARPANET and the Internet. (The previous link is to a text version of the historical article. Contact me if you would like a pdf of the article as it appeared in the Communications of the ACM). 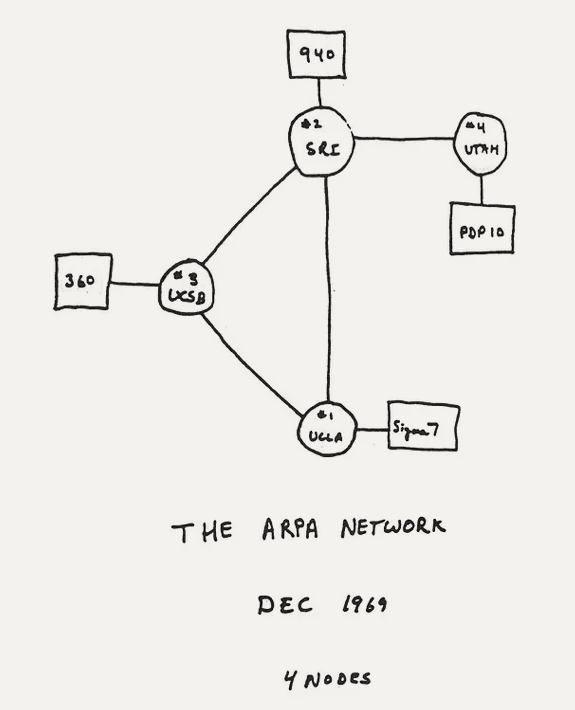 Log entry for the first ARPANET message (Source: DARPA)The anniversaries of these milestones remind us of the economic and social returns we have seen from Federal research and development programs. When President Franklin Roosevelt was inaugurated in 1933, he enacted many ambitious government programs aimed at ending the great depression — a "new deal." He initiated programs like Social Security and infrastructure projects like rural electrification. Confidence in the Federal Government being able to pull off large, successful programs continued through World War II, the Berlin Airlift and Marshall Plan, the Interstate highway system and the space program. President Kennedy kicked off Apollo program in 1961, saying he believed "that this nation should commit itself to achieving the goal, before this decade is out, of landing a man on the moon and returning him safely to Earth." But pendulums swing and, in a 1986 press conference, we heard President Reagan say "The nine most terrifying words in the English language are: I'm from the government and I'm here to help you." Today we are discussing a "green new deal” — is the pendulum about to swing back? I don't think we're having anywhere near the conversation we need to have about the missing piece of China policy which is: what is the United States going to do? Why isn't this a Sputnik moment for the United States? In the late 1950s, when the Soviets launched the Sputnik satellite, the United States undertook an enormous national effort that changed the way we taught math and established NASA and the Golden Triangle of technological and innovation development between the government and research universities and private companies. We face a similar challenge at this point in terms of technology competition with China. That is something I think we need to be talking about and the discussion includes immigration policy, infrastructure investment, education investment and [consideration of the] impact of technology, particularly artificial intelligence, robotics and automation on labor markets. Populism is not at its peak right now — we need a really serious discussion about how we are going to manage the future of work in the face of technology. This comment was made at around 33:15 of the interview. Local Time: Tuesday, April 23, 2019 07:40 AM PDT – Page Load: 0.2761 Sec.